Older Building? No Space for Ductwork? What is VRF? It saves you money! Invented in 1982, by Daikin Company. VRF stands for Variable Refrigerant Flow, and utilizes small refrigerant piping systems versus large standard air ductwork to heat and cool individual spaces. VRF takes up a smaller building footprint and can be used when traditional duct work becomes a challenge. VRF is commonly used in education, healthcare, hospitality, and government buildings. 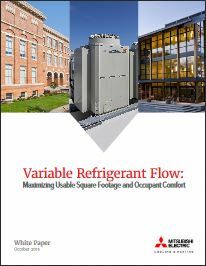 Building applications where VRF is most beneficial is in Quiet Spaces, Historical Renovations, and Building Additions and Renovations where space is often limited. However, VRF is commonly used in Low & High-rise Multi-zone, Office, Mixed-Use, Light Industrial and Data Center Buildings. Contact us to see if a VRF system is right for you.